She contacted me: "I'm fostering a dog for the National Disaster Search Dog Foundation that doesn't look like he's got quite the temperament for them. Starting to look for another home for him, and I think he might be right up your alley. Any chance you're thinking it's time to find another dog?" I said "Actually, yes. Been starting to think about it." What's he like? Tsuki was hoping for a girl hee hee - big flirt." "He's great with other dogs, great with kids, great with women (a little reserved until he gets to know adults, but a sweetie with kids). Fine with cats as long as the cats don't run from him - then he'll chase them." "He's both toy and food motivated (very). Not afraid of climbing on anything, good on unstable footing, great jumper, likes going through tunnels. Very good in crowds - I've taken him to obedience trials, dog training classes, herding trials, and a BIG family gathering (at my brother's house, not ours), and he wasn't nervous at all. Protective at home with men, which needs to be controlled. When I got him, my 6-foot 4-inch nephew was staying with me, and Turbo fell in love with him - so it's not that he doesn't like men. He just needs time to get to know them. If they ignore him and let him sniff them, he'll approach for pats within a few minutes." So I drove out to her place with Freeway and Tsuki. They did exactly as I expected. They mostly ignored Turbo. Some brief hellos then "the boys" were off exploring the really cool ranch. We took them out to a grassy area and threw a ball for Turbo. Turbo loved it. Freeway and Tsuki had fun exploring. 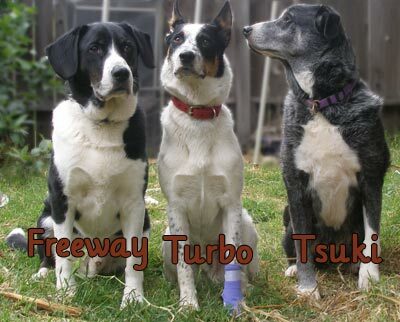 Every so often Freeway would half heartedly run after Turbo and maybe bump him. Turbo was more interested in the ball. Another friend arrived with her dog and we were joined by the resident dogs. 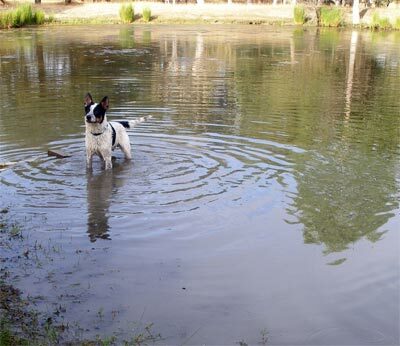 We all went down to the pond for more fetching and socialing. There were six dogs in all. Interestingly Freeway really only interacted with Turbo. He seemed undecided whether to play or dominate him. At the end of the evening I said I'd like to take Turbo home. It has been just barely 48 hours and things are going well. Right now Tsuki and Freeway are treating Turbo like a guest, and he is acting like one. Everyone has their company manners on. I expect there will be some minor bumps in the road as Turbo gets to feel at home and as the others recognize that he is here to stay. I think it will go well. He is a bright dog, and takes his cues from the other dogs as well as from me. He has excellent leash manners, and is already tuned into the "don't do that" acht! noise I make. It is delightful to have a dog who is both highly food motivated, and yet controlled. I put the dog bowls at nose height when I was filling them, and told him he could not help himself, so he didn't. That didn't stop him from walking on his hind legs in hopes of a reward when I carried the bowls into the kitchen. Right now he is sleeping in a crate (door open) next to me in the kitchen. Freeway is at my feet, and Tsuki is in the front room. It is all very cozy so far. So 30 May 2009 is Turbo's "Got Day"...if he is 18 months old that puts his birthday at about 1 Dec 2007.